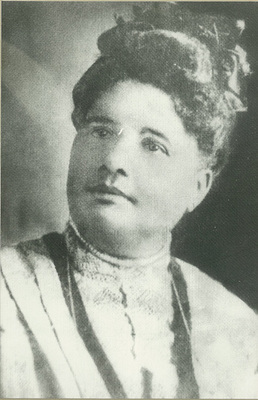 Frances was born in a log cabin in Holmesville, Mississippi, in 1861, of African American and Native American descent. Raised by her grandparents, she later went to live with a brother in New Orleans where she attended school and Straight College. While still a young woman, Gaudet dedicated her life to prison reform. In 1894, she began holding prayer meetings for Black prisoners. She wrote letters for them, delivered messages, and found them clothing. Later, she extended this ministry to white prisoners as well. Her dedication to the imprisoned and to penal reform won her the respect of prison officials, city authorities, the governor of Louisiana, and the Prison Reform Association. In 1900 she was a delegate to the international convention of the Women’s Christian Temperance Union in Edinburgh, Scotland. Gaudet worked to rehabilitate young Blacks arrested for misdemeanors or vagrancy, becoming the first woman to support young offenders in Louisiana. Her efforts helped to found the Juvenile Court. Deeply committed to the provision of good education, she eventually purchased a farm and founded the Gaudet Normal and Industrial School. Eventually, it expanded to over 105 acres with numerous buildings, and also served as a boarding school for children with working mothers. Gaudet served as its principal until 1921, when she donated the institution to the Episcopal Church in Louisiana. Though it closed in 1950, the Gaudet Episcopal Home opened in the same location four years later to serve African American children aged four to 16. Frances Joseph Gaudet died on December 30, 1934. I Merciful God, who didst raise up thy servant Frances Joseph Gaudet to work for prison reform and the education of her people: Grant that we, encouraged by the example of her life, may work for those who are denied the fullness of life by reasons of incarceration and lack of access to education; through Jesus Christ, who liveth and reigneth with thee and the Holy Spirit, one God, for ever and ever. Amen. of life by reasons of incarceration and lack of access to education; through Jesus Christ, who lives and reigns with you and the Holy Spirit, one God, for ever and ever. Amen. I had never heard of this person before reading the bio and would like a bit more detail, with dates. For example, when exactly did she ‘eventually’ buy the farm that became a school? What was Straight College? When did she graduate? Born in 1861 in MIsissippi, was she born slave or free? Why did her grandparents and not her parents raise her? I know we are constrained by the format of HWHM, but detail brings people to life. Again, this bio uses terms not used or capitalized consistently throughout HWHM (examples: African American, Native American, Black ). 2nd paragraph: One sentence refers to Black prisoners and the next to white prisoners. If Black is capitalized, should white be capitalized? This is the kind of conundrum that occurs when editting is not consistent.. Collect: And of all of the possible phrases available it reads: “… the education of her people …”. Her people! The people of Louisiana? Black people of Louisiana? Working mothers? Women? Black and white prisoners? Line 2, second paragraph: substitute “prisoners of color” for “Black prisoners”. It is hard to be accurate and consistent for the future in this “minefield”. “African American” has already been used in the previous paragraph; although it could be used again here, I recommend avoiding the capitalized form “Black”, which seems abrupt and dated. Note that “white” in the same paragraph is not capitalized. Line 3, third paragraph: substitute “African American” for “Black”. Line 4, third paragraph: move “in Louisiana” to follow “woman”. Last paragraph: add “, in Chicago” after “1934”. This bio description says nothing about a Christian faith being part of her commitment to prison reform, education, or families with working mothers. If there’s nothing to say, it calls into question her inclusion in a work on HWHM. If there is something to say about a faith life, it calls into question the adequacy of the write-up. Again, I use the bio and collect in daily office, hence my silence about the scripture selections. The collect is terrible, for the same reasons previously explained.Micharl already questioned the phrase “her people.” This collect doesn’t even have a thanksgiving for her life — just invocation, “who raised up,” and “for xyz work” (which strikes me as a dehumanized summary of her life’s fullness and spiritual worth). Then a formulaic petition (she did x, may we in turn do x, too), and a trinitarian closing of a rather curt, utilitarian style. The problem with petitions of the form “he/she excelled at x, let that inspire us to do x, too” is that after a year of commemorations we end up resolving to reflect everybody else’s gifts and calling, but not relating them to anything central in our own circumstances. Since we can’t realistically achieve imitating everyone, the effect is to pull the rug out from the meaningfulness of the several petitions, rendering them somewhere from vapid to conflicted. This one, praying that we “may work for those who are denied the fullness of life by reasons of incarceration and lack of access to education”, has problems. Theologically, (e.g., John 10:10) Jesus offers fullness of life, and Romans 8:35-39 says nothing about “except for those who are denied the fullness of life by reasons of incarceration and lack of access to education.” Practically speaking, this collect is mute about WHICH needs require what kind of attention from the church’s members and ministry, and is totally amorphous about what we’re allegedly asking God to help us do. In my opinion, it’s a muddled collect, flawed in both form and content. John LaVoe’s point about the collects as a series is a good one, and should be given thought and discussion. We can all give sincere thanks for the work of 98% of those commemorated in this calendar, but we cannot all sincerely pray that God will help us follow the example of every one of them. To do so would make it impossible to imitate any of them with more than lip service. We could probably all pray that God would continue to call people into such ministries, and that the church would encourage and support them, but ‘we’ and ‘us’ should probably be used a lot less often than they are. In this particular collect, the bare ‘through Jesus Christ’ feels terse and abrupt. ‘Through Your Son our Savior Jesus Christ’ or that most basic of all creeds, even a sufficient statement of the Christian faith in the eyes of some, ‘through Jesus Christ our Lord’, is so natural here as to distract the worshipper when it is removed. Frances Joseph Gaudet is commemerated today for her work in prison reform. Worth reading.